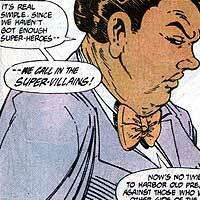 Amanda Waller is the efficient but amoral government bureaucrat who has long coordinated covert teams of super powered individuals such as Task Force X (also known as the SUICIDE SQUAD) and CHECKMATE. She has long worked behind the scenes in promoting the interests of the United States, often coming into conflict with the heroes of the world who disapprove of her realistic political approach to solving delicate problems. Amanda Waller was one of the chief strategists for Earth's HEROES OF THE INVASION against the ALIEN ALLIANCE when she first worked with Booster Gold and the JUSTICE LEAGUE. Since that time, Booster and Waller have worked together to confront several major threats to the world.